It is worthwhile knowing who is spending most of their time online to shop, especially when considering your communication strategy. 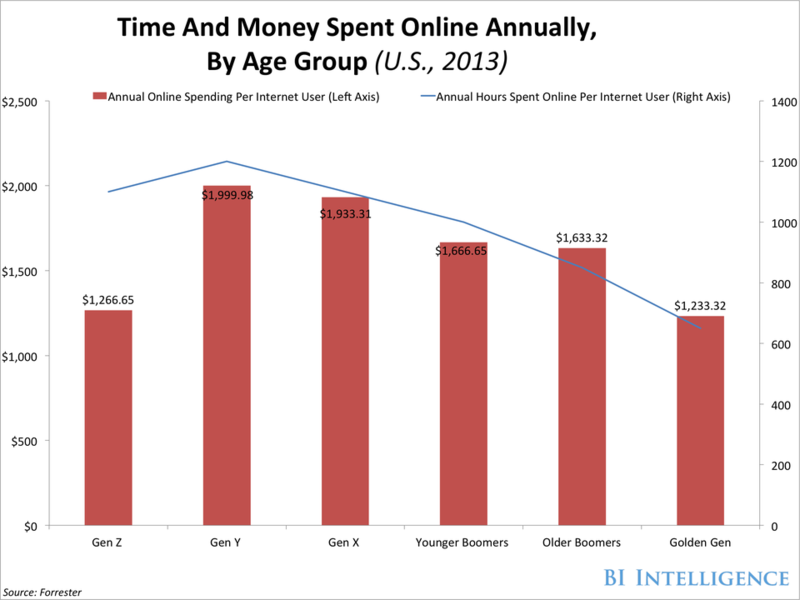 Below we see an exert from Business Insider showing who is spending the most online by age group. In the first quarter of 2014, 198 million U.S. consumers bought something online, according to comScore’s quarterly State Of Retail report. That translates to 78% of the U.S. population age 15 and above. But who are these shoppers driving the trend of buying online and on mobile devices? In a new report, BI Intelligence breaks down the demographics of U.S. online and mobile shoppers by gender, age, income, and education, and takes a look at what they’re shopping for, and how their behaviours differ. It’s important for retailers to know who their potential customers are online in order to market to them effectively. The conventional wisdom is that women drive shopping trends, since they control up to 80% of household spending. However, when it comes to e-commerce, men drive nearly as much spending online in the U.S. as women. Men are more likely to make purchases on mobile devices. Fifty-seven per cent of women made a purchase online in 2013, compared to 52% of men, according to a study conducted by SeeWhy. But 22% of men made a purchase on their smartphones last year, compared to 18% of women. Millennials, those consumers aged 18 to 34, remain the key age demographic for online commerce, spending more money online in a given year than any other age group. They spend around $US2,000 annually on e-commerce. This, despite having lower incomes than older adults. Boomers and seniors have adopted mobile commerce. One in four mobile shoppers in the U.S. is over the age of 55. That’s about even with their share of the overall U.S. population. Online shoppers tend to live in households with higher-than-typical incomes. An Experian survey found that 55% of e-commerce shoppers in the U.S. live in households with incomes above $US75,000 (40% were in households earning $US100,000 and above). The median household income in the U.S. is around $US50,000, according to the Census.